Cupcakes 'n Daisies: Thinking Ahead . . . . I hate marking the lines and this worked wonderfully. I am looking forward to seeing your faceted jewels! But you will definitely need to hurry. March 1 is not too far away. The new quilt you are working on is going to be lovely in those fabrics. I use the Angler, too and I really like it. It's a bit frustrating to have it taped onto the portable table-thing that slots around my machine, because I don't like to take it off once it's in place, and that makes it hard to change the bobbin. But it's worth it to avoid drawing all those lines. I also use Thangles for HSTs sometimes. I really hate drawing lines. I just found out about the Angler. Looks interesting. I usually don't change patterns very much. I haven't gotten to that place yet. I love the fabric you're using for your next project. I love the angler, even though it's a bit big for my machine. You know the way you can re-visualize a quilt you should be writing patterns yourself! I hate drawing lines too...I use the Angler and really like it. I'll be looking forward to what you do with this pattern. #question - I have a jelly roll that I am going to also have to untie. Do you pre-wash your jelly roll? Answer for Angie: Do Not Pre-Wash the Jelly Roll. You will have the biggest mess you ever saw. Don't do it. Darn, I wish I hadn't frittered away my ShangriLa. Actually, a lot of it ended up in my Drumbeat/Cupcake quilt, so that's all right. I really like your new quilt! And just love those jelly rolls. I've just discovered them, but have yet to untie them. Sorry - I had to delete my previous commment because I made so many typos! I can't wait to see how you proceed with State of Grace. I love those fabrics, of course. I'm excited for the unveiling of Faceted Jewels! I would hate to unroll the jelly rolls, too! And MY rolls breathe a sigh of relief when I take my jeans off whether I've had pizza or not! YOU are so FUNNY!! Oh, I love that quilt - State of Grace! I can't wait to see your progress. 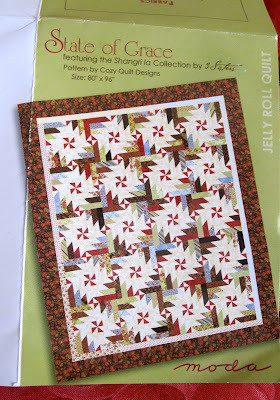 I had the same kit - tin, jellyroll and all but I used the jelly roll on a project for a friend and never made the quilt. I'll live vicariously through you! I about fell out of my chair laughing when I read about your rolls and jeans and pizza, you are so funny!! I LOVE Shangri La, I am on my 3rd quilt using that fabric. I have several jelly rolls too, just haven't busted them open yet. I love it when a post makes me laugh! Thank you for that. How funny about the jelly rolls and the rolls being free from your jeans. I also enjoyed your analogy of your fabric breathing like a fine wine. I can't wait to see your finished Faceted jewels quilt. I don't like drawing lines either. I'll be interested in hearing how the angler works. Haven't tried that. Sometimes I'll put my earbuds in so my hands are free and call my sister or a friend while drawing lines as Heather mentioned. Otherwise, no fun drawing lines. so ... you're ready to ATTACK the state of Grace, Shangri La, and three sisters all at the same time ... and you have your battle plans written up ... does the guvmint know about you? 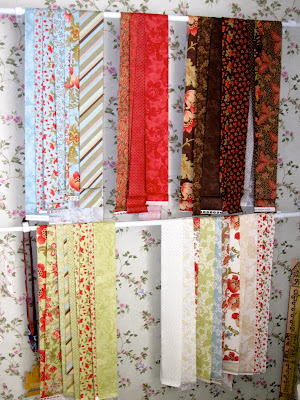 After I read your blog, I think about things I need to finish in my sewing room; and I think "blah". I wish I had your talent for pairing up fabrics and patterns. Everything is always so nice. Loved your comment about the pizza and jeans!! and still have not found the white print they used... do you have plans to use it or something different?